Small living rooms need to right furniture to make them looked balanced and spacious. 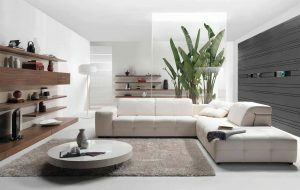 Here are some simple tips that will help you make the most of your small living room. Accentuate the room’s best features – Start off by listing the rooms assets and its focal point to understand what is the best feature in your living room. For example, if your living room gets a lot of light, look increasing the natural light by adding lighter furnishings. Scale down furniture – Size matters for smaller spaces, but this does not mean that you can’t invest in a sofa or a dining table. It just means that you need to look at pieces that are smaller, more structured to help your space look larger yet comfortable. Avoid bulky pieces and opt for glass, light bookcases, and workstations. Get creative with the layout – Getting creative and moving away from conventional ideas is a necessity when working with a small space. For example, You can look at placing two sofas back to back to provide seating for two spaces and create a division for your living and dining room. Use decor to add visual interest – Lighting is a big part of small living spaces. This is because the right lighting can create interest and draw attention to different parts of your space. Look at balancing light by adding built-in bookshelves and eye-catching artwork coupled with lighting that highlights and draws the eye.